Journalists Ben Fordham and Jodie Speers welcomed their first child on December 5, and have named their son Freddy Thomas. Freddy Fordham was born at 9 pm, weighing 3.5 kg (7 lb 7oz), and 50 cm long; he arrived as his parents were due to have Christmas drinks with the prime minister, but a baby is far more important than a prime minister, and Freddy’s birth took precedence. Ben is a Walkley Award winning journalist who recently left the Channel Nine Today show as sports reporter, and is currently a radio host on 2GB’s Sydney Live. 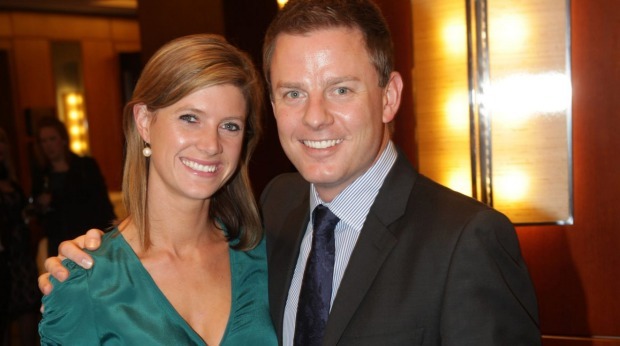 Jodie is a reporter for Channel Seven News; she and Ben were married in 2011. Radio host Jason “Labby” Hawkins and his wife Lou welcomed their son Felix a year ago. After seven years co-hosting B105’s breakfast show with Stuart “Stav” Davidson and Abby Coleman (both featured as celebrity parents on the blog), Labby is now moving to New Zealand to take up new professional opportunities. His nickname Labby is short for Lab Rat.